One of our members of staff, Mr Ward, has organised a fundraising event to support the Teenage Cancer Trust on 30th July 1-5pm. It will take place on the main field at Huntcliff School, with other activities happening in the sports hall and within the sheltered area beside the MUGA. 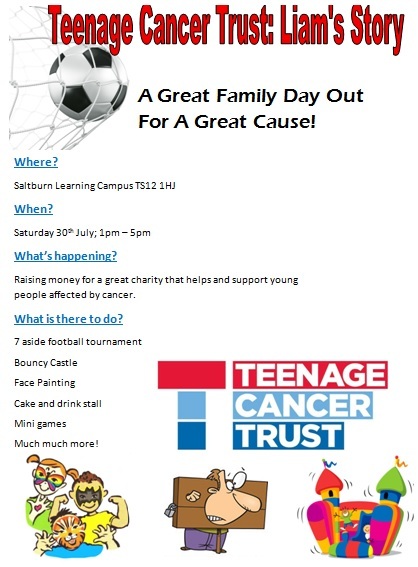 There will be a football tournament, bouncy castle, face painting, cakes, sweets and drinks stalls, and mini games! We are hoping to also have an ice-cream van with us in what will be a fabulous day. The event is free of charge however donations will be welcomed to help the group raise their target figure. Come along and enjoy an afternoon of fun with all the family! The school carpark will be open for people travelling by car.